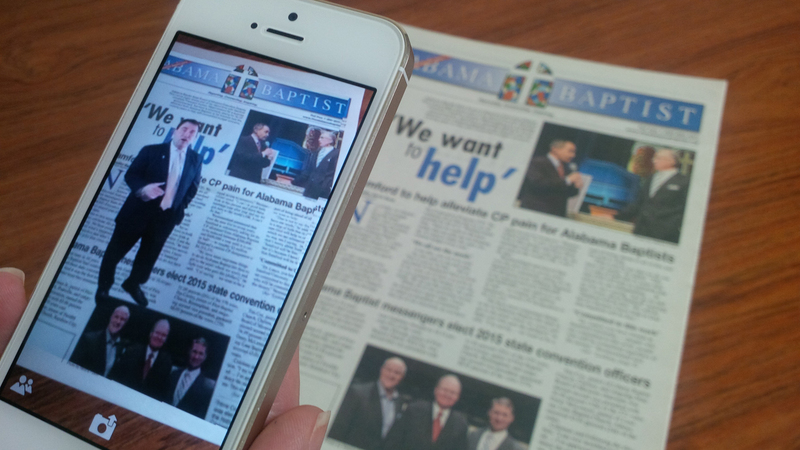 BIRMINGHAM, Ala. (TAB) —Revealed in its Aug. 27 issue, The Alabama Baptist (TAB) continues to build and hone its new feature called Augmented Reality, which was developed by Samford University. By simply downloading an app, readers can view additional news and information via cutting-edge technology. Download the free Aurasma app on any iOS or Android device. Open the Aurasma app and tap the “A” icon at the bottom of the screen. Return to the camera by tapping the center icon at the bottom of the screen and hold your device over the article you are reading. Close out app when you are finished. When ready to experience augmented reality with TAB again, click on the app to open it. Hold your device’s camera over the Augmented Reality-labeled article and watch it come to life with new and engaging content.